Visitors to the front page of China’s YouTube-clone Youku are spoilt for choice. There’s a clip of Taiwanese TV show host having an argument with one of her guests (which has had about 1.5 million views), and a video of some people in Zhejiang province getting soaked by an unexpected wave (currently at about 1.3 million views). Netizens on Youku and microblogging site Sina Weibo have, for the most part, not been taken in by the video’s special effects. Comments instead focus on the editing skills shown by the video’s creator. “Finally, there’s hope for Chinese Cinema,” writes one Youku user. The video taps into a more general sense of excitement about the extra-terrestrial activity, sparked off by a number of alleged UFO sightings this month. On the evening of August 21, a strange bright light was visible over Shanghai. The previous day, a pilot flying to Shanghai posted on his Sina microblog that he’d witnessed an illuminated sphere in the sky “﻿﻿hundreds of times bigger than the moon”. 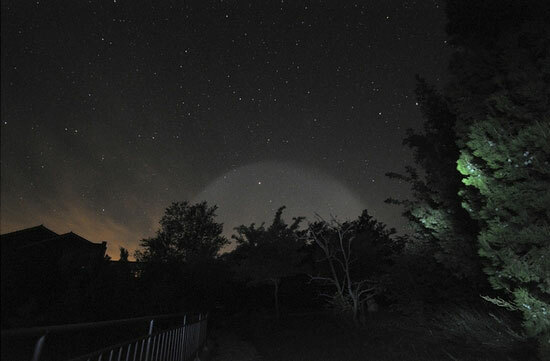 The same night, Beijing residents used their microblogs to post pictures of a mysterious halo of light which appeared over their homes. There have also been UFO sightings in the provinces of Guizhou and Shaanxi this summer, according to the China Daily newspaper. With no official body keeping statistics on UFO sightings, its hard to say whether the number sightings this year is unusually high. However, its clear that the popularity of microblogging services in China is giving Chinese UFO spotters a new channel to publicise their photos, and provide inspiration to China’s budding Sci-Fi directors.